Observation - Stereum hirsutum - UK and Ireland. 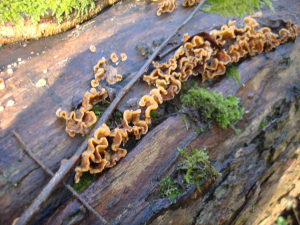 Description: Thin lines of a bracket fungus along a horizontal branch of an old willow tree. Thin lines of a bracket fungus along a horizontal branch of an old willow tree.